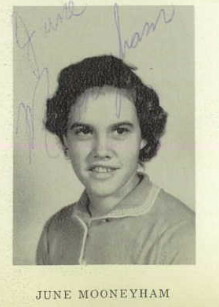 Ruth Masten has advised that Dorothy Vawter taught the school in 1958-59. 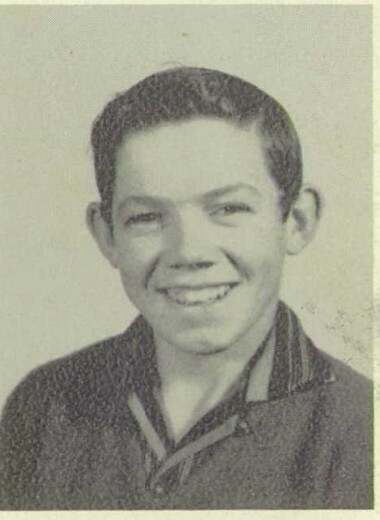 Wendell Rufener, in a telephone conversation in February, 2018, remembered the 1958-1959 school year as the last. He recalls there were only three students: Wendell, June Mooneyham, and Marlene Wray. He recalls Bob Smith buying the old Trachta place, the Everett Phillips place, and the acreage to the east of the Trachtas, known as the Straus place. 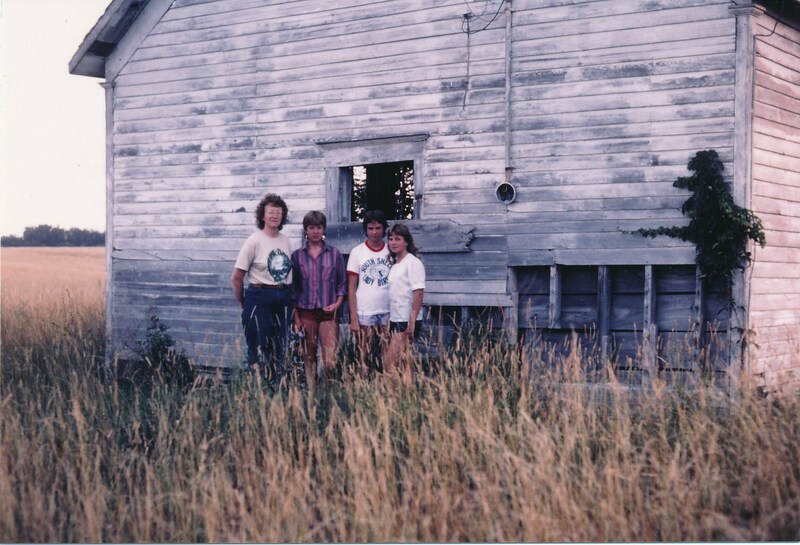 Wendell remembers the old Trachta house and barn being bulldozed down. He also remembers the school being taken down at the same time, but others remember it being moved half a mile west. We are seeking clarification on this point. The above picture of the school does not appear to be in the same location. Anyone with information on these years, or any other, is invited to share it with us. 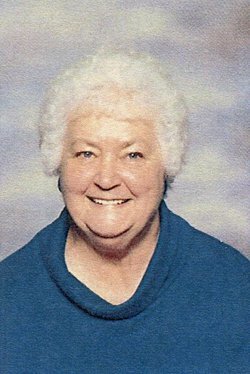 Dorothy Ailene Vance Vawter-York, last teacher at Bohannon School. Sometime in the late 1950s or early 1960s, the school house was moved from its location opposite Manley Graves' house, to a location about a half mile west, near the turnoff toward the 1950s location of Everett Phillips' house (on what was called the Tom Bohannon place on the 1918 plat map). In the time the Trachta family lived in the area, there was a farm house at that locaation, occupied by the Griffith family, among others. A Google search today for "Bohannon School" in Macon County, Missouri, returns this latter-day location as a historical location. There is nothing there anymore. Likewise, there is nothing at the old location further east, where the school house stood for most of its life. Judging from the above picture, made in 1982, the school building was modified in later years. That window we see was not there during the 1950s. Looking in the door of the building, in those days, revealed an expanse of tongue-and-groove floor, oiled, a row of windows to the left, a large coal furnace to the right, with a window behind it, school desks arranged in rows and columns, extending forward to a low stage. The stage was raised perhaps eight or ten inches, and accommodated the piano, the teacher's desk, and some maps. The furthest wall, at the back of the stage, where we see the window in 1982, was a wall-to-wall blackboard where students practiced their arithmetic during recitations. The purpose of that window, and the reason for putting it in, is unknown. Perhaps the school was used for some other purpose after its removal. In 1996, after more than fifty years, Gregory Trachta revisited the area. There was no trace of the school, or of any other familiar structure, except for Lee Graves' house, and Manley Graves' barn. Houses, barns, fences, bridges, and probably people, from the Bohannon-School era were gone. Wendell related memories of the school and the times during the telephone conversation cited above. He recalls that after the Trachta family moved out, Maggie Davenport lived at their old house during her last year at the school. This would have been the school year of 1954-55. 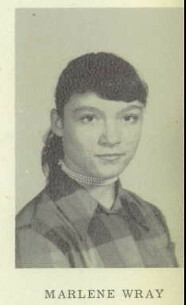 The Rufener and Dunaway children would be walking to school, and as they topped the hill east of the creek, they could see the old Trachta place, and would often see Mrs. Davenport leaving her front door to walk up to the school. "We would take off running and beat her to the school." Pretty good for youngsters giving up a head start of about a quarter of a mile. Wendell recalls Bob Smith buying the old Trachta place, the Straus place to its east, and the Phillips place to its west (where the school stood). Bob Smith cleared off the buildings sometime in the 1960s. Wendell does not recall the school being moved, but others report it standing in a location to the west, a few years later. This anomaly is still being investigated. Wendell recalls the Straus place as where John Butkovitch lived, during his tenure at Bohannon. Wendell tells us that he married Kathy Ann Van Houten in 1968, and he and his wife have four daughters. This is the same Van Houten family former teacher Paul Toops stayed with when he taught the school in 1952-53. Wendell and his wife built a house about two miles from where he and Bobby grew up, and he farms in the area with his brother, Bobby. Wendell tells us Bobby had a tractor accident a few years ago, but suffered no serious injuries. 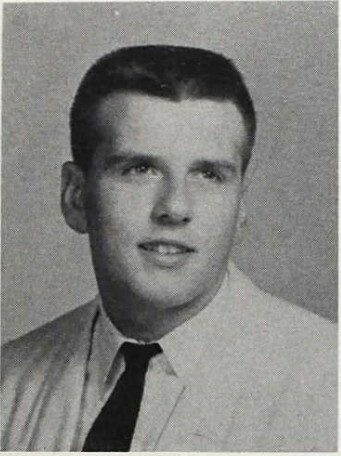 As a side note, we're not sure what became of John Butkovitch, but perhaps he's the same John Butkovitch who graduated from high school in Independence, Missouri, in 1959. Greg Trachta (3rd from left) in Trachta front yard with schoolmates. 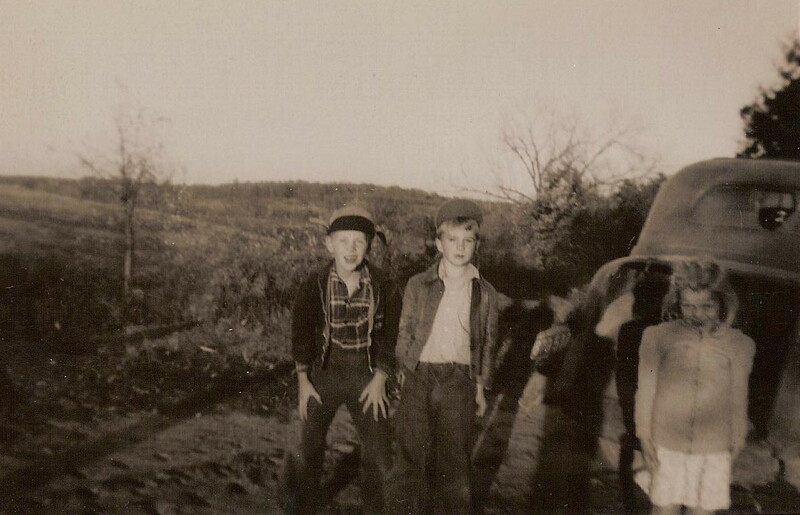 This might be the Griffin children and perhaps Deanna Hoffman, about 1951 or 1952. 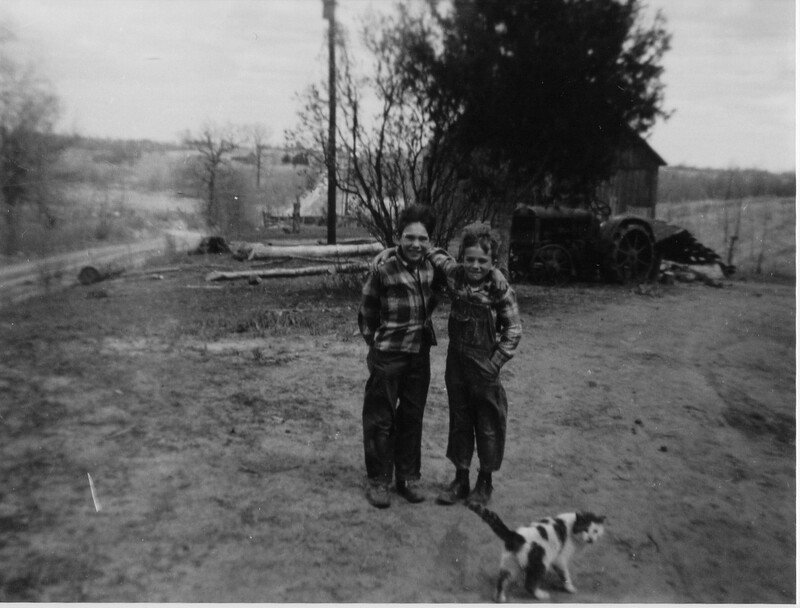 Melton and Greg Trachta, about 1952, in the Trachta front yard. The camera is looking east, down the road in the direction from which the Rufener children came on their way to school. 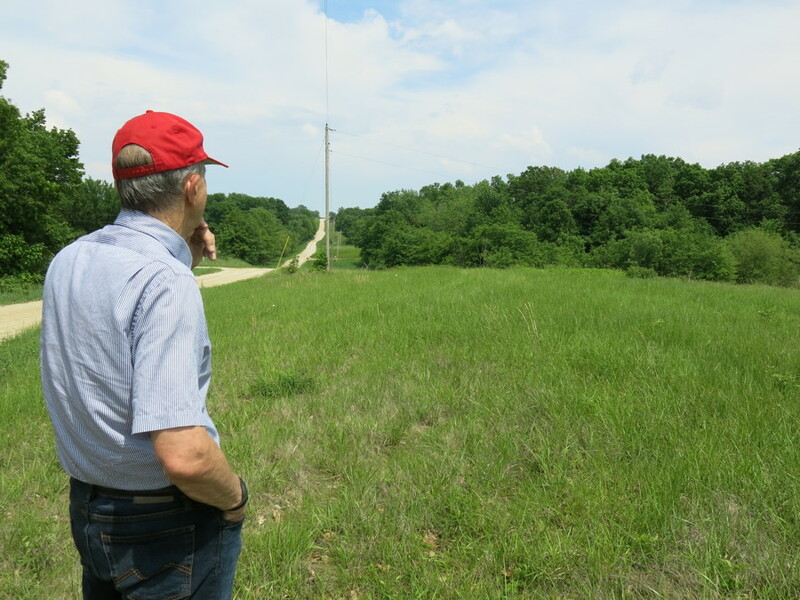 Greg Trachta, in 2014, looking east from the Trachta home site, from his approximiate location in above picture. Greg (middle) and friends. 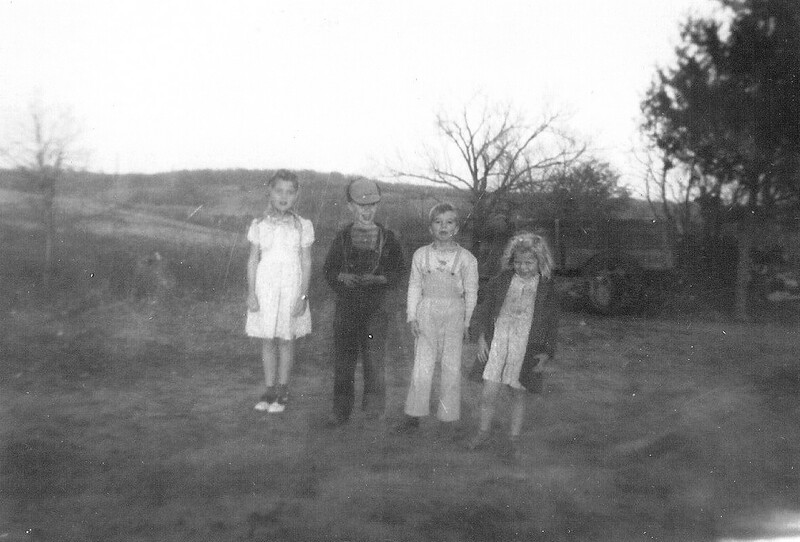 These might be the Griffith children, who lived briefly a half mile from the school. The car in the background of this, and other pictures, is the 1935 Plymouth the Trachtas drove from Richmond, California to Missouri after the war, in the winter of 1946 and 1947. It has been heavily customized for farm use, including transport of livestock to and from Lolli's sale barn in Macon, Missouri, hauling stuff that wouldn't fit in the trunk, and something that evidently needed to protrude through the rear window. Cars in those days, and circumstances, were versatile machines.